DARE, DREAM & REALIZE: Why Network Marketing, And Why QNet??? Network Marketing is the business of the 21st Century, and a definite source for laying a pipeline for passive income, and thus achieving the much desired time and financial freedom. What better than realizing it with full support from QNET. The views expressed on this site are strictly personal. All the material posted here is a collation after surfing the internet. Due credit is acknowledged to the originators and owners of various sites from where information has been gained. 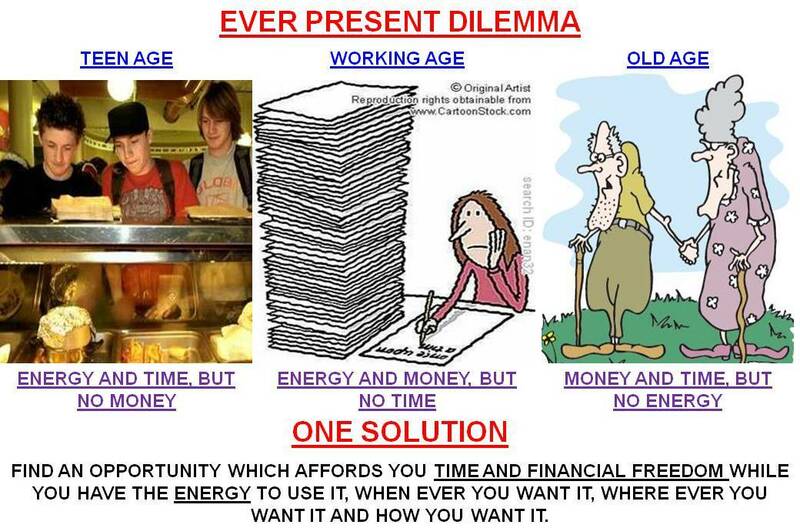 Why Network Marketing, And Why QNet??? Some time back one of my close friends, suddenly bumped into me unexpected. After back slapping and exchange of pleasantries and asking about the whereabouts and welfare of each other’s families, he asked me, “What do you do for a living?” I replied, “I am on my path to achieve time and financial freedom, through Network Marketing with QNet.” “Network marketing? What’s that, and how does that help you”, he enquired without giving a break. We had both studied together in the school, however thereafter I joined the Armed Forces and he chose to pursue a career in the corporate world. We both enjoyed good life, commensurate to what the careers we were pursuing offered us. And, both of us did well in our respective fields. However, one day I decided to hang my uniform for various reasons. The most important of these related to the amount of time I could spend with my family. I enjoyed an envious lifestyle and also got paid reasonably well, however frequent transfers and sometimes to remote locations where provision of social facilities to the family were a challenge weighed heavily on my heart. I was not able to spend adequate time, both in terms of quality and quantity with my family. I being a family man, it mattered to me. My friend comparatively was on advantage. His family stayed with him. That was actually the end of the advantage, because his job content ensured that most of the times he did not stay with the family. While my frequent transfers and change of locations was an organizational requirement, even he moved to various big and small cities seeking promotions and advancement in his career. This ensured that children of both of us did not get to have continuity of friends and good schools. It was break even for us, as both of us bore similar discomfort. So, the good life started to become disinteresting for me, and correspondingly it was good money starting to become disinteresting for him. To sum it up, we were not able to do, what we wanted to do, when we wanted to do it and where we wanted to do it. The picture below may somewhat succeed in highlighting our dilemma. Thereafter, I decided to atleast stay at a place of my choosing, work in a company of my choosing, and provide continuity of stay, friends and good schooling to my wife and child respectively. So, I hung up my uniform, and moved to an upcoming Metro and ensured these things happened. I now had a JOB, if I can term the earlier one as profession. I was now happy, or somewhat happier. However, my dilemma as talked about earlier, still persisted. And, then one day I providentially chanced to meet a senior brother officer who was (and continues to be) involved in Network Marketing through QNet. He introduced me to the whole concept with patience, and that impressed and influenced me tremendously. However, being the type of skeptic person that I am, I embarked to research the subject. 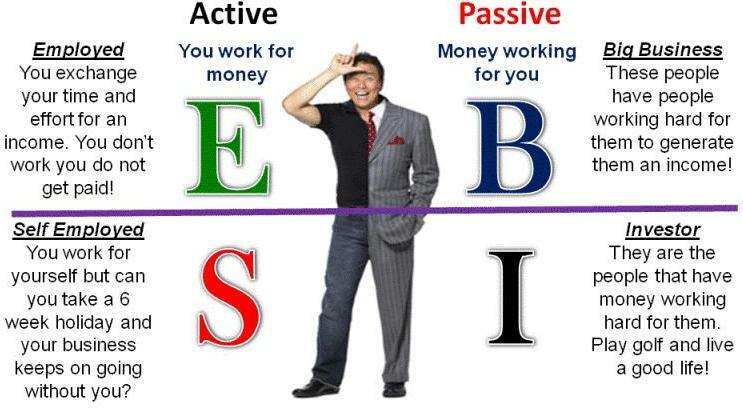 The very first and prime focus was to understand the ESBI-Cash Flow Quadrant. I then started with reading of the few books that he had mentioned. First one being ‘Rich Dad, Poor Dad’ by Robert Kiyosaki. It was really impressive and made me start looking at the world and life with a different perspective. Then with hunger for more information, I passionately read his other two excellent offerings, i.e. 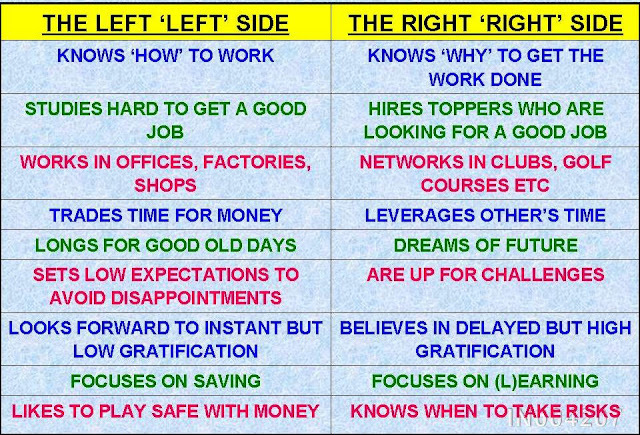 ‘The Cash Flow Quadrant’ and ‘Business of the 21st Century’. Apart from reading these books, I also surfed for and read the related material on the internet. I not only looked for positive information, but also looked for suitable criticism. 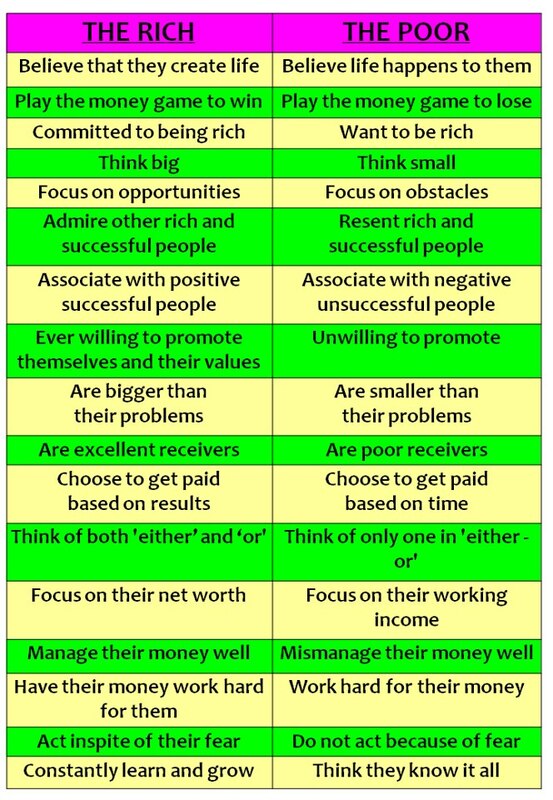 I found both, however the positives mercilessly outnumbered the negatives. And these negative mostly had a tint of failure of the agonist. Then I went on to read 'Book on Network Marketing' - by Richard Kall, 'Think and Grow Rich' - by Napolean Hill, 'You Were born Rich' - by Bob Proctor, 'Copycat Marketing 101' - by Burke Hedges, 'MLM Secrets' - by Brian Garvin, 'Your First Year in Network Marketing' - by Mark Yarnell and Rene Reid Yarnell, 'The Secret' - by Rhonda Byrne, 'Parable of the Pipeline' - by Burke Hedges, and everything else that I chanced upon. I also learnt a lot about the science and mechanics behind this Direct Selling industry, and this method of network marketing through numerous sites on the internet as well. The most impressive for me was http://www.network-marketing-business-school.com/index.html from where I learned a lot and then moved on to expand my horizon. For me, it was more important to understand the merits of the industry and the marketing process than to research a particular company per se. That would come later. So, I explained to my friend, the following things and the reasons for my getting into Network Marketing. To cut the long story short, I will summarise it point wise. Kiyosaki’s research on Cash Flow Quadrant has adequately motivated me to change my address, yes from the ‘left’ left side of the Quadrant to the ‘right’ right side. Why? This picture will explain that. 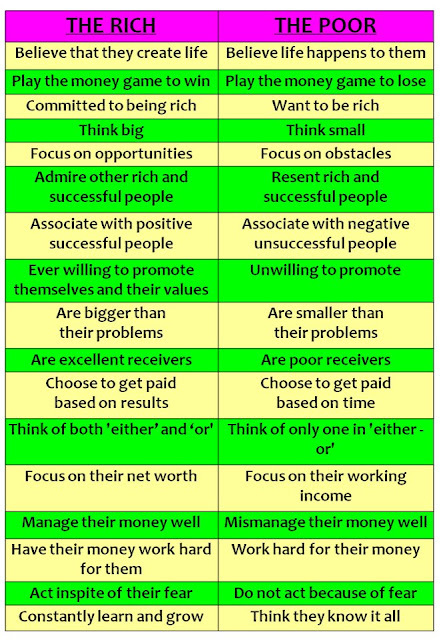 I am determined to move to the minority rich group from the majority average group . Why? This picture will explain that. I want to exploit the huge potential this opportunity offers to exponentially increase my circle of friends. I just love to be in company, and good company which is always thinking progressively. It offers me tremendous desirable happiness, money is just a byproduct. 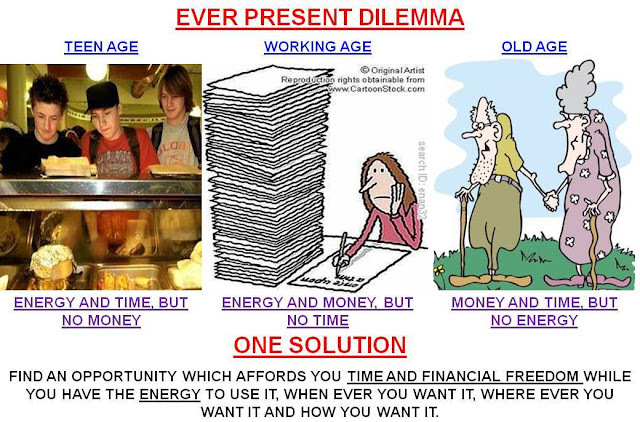 I sincerely want to share my assured success with my near and dear ones and complete circle of friends, and take them along to bask in this enormous opportunity for time and financial freedom that Network marketing offers. I as much want my children to be available to me to for spending both quality and quantity time together, as I desire to spend the same with my parents and being available to them and serve them well. This offers me that, as I will surely provide an extremely firm foundation of time and financial freedom to my child. I want to be my own boss, and pursue my own dreams instead of working for someone to help them fulfill their dreams. I would not like to work to buy a car to go to work, rather I would like to work to buy a car to go around the world in it. JOB means ‘Just Over Broke’ to me now. The risks involved with pursuing such a venture are extremely negligible, or rather nonexistent, and returns compared to time and money invested, are extremely huge and non comparable. An un-noticed advantage of network marketing is personal development. Network marketers are prolific readers of personal development material and through extensive interaction learn and hone up their such skills as public speaking, mentoring, coaching, how to relate with others etc. And, it’s been noticed that serious network marketers also grow spiritually regardless of their religion. And, I would like to contribute in any manner possible, however small it may be, to make this world a better living place through charitable initiatives, something which is extremely feasible through this venture. The expression then seen on the face of my friend cannot be explained. He was aghast. He was surprised. He was mesmerized. He was happy and sad, both at the same time. Sad for being so ill informed and unaware that such opportunities exist and the vast and innovative leap that the world has witnessed in the field of marketing; and happy that it was not too late for him to know about this excellent opportunity from one of his dear friends. Quality Products and Services: The company must strive to provide very high quality products. These products especially wellness ones must have scientific tests to back them up. They should yield the promised results. Rare Products and Services: It would lose meaning to walk down the street in any store and find the product. It is also critical to have a product with retail customers. Those not interested in the compensation plan. Transparency: The company must provide a clear system where distributors can track their efforts. They should get their cheques on time. Personally, The IR should rather deal with the Company directly. The concept of middle men has really brought many wrangles. Technology Friendly: Gone are the days when distributors had to create room in their small homes for the company's products. With the advanced technology, you should be able to make a sale just by one click on your mouse. However, if your target market "believes by seeing", then you want or need to possess products to demonstrate with. Known Company With Global Business: The company should be recognized Internationally. Surely by searching Google, you should be able to find it. They should have real offices and staff to connect to in case of a problem. Time Factor: How long has the company been in operation? This is very important especially if you are not a risk taker. Check out the pros and cons of joining it. Costs: This is very critical. You must know costs involved. Sometimes the start up costs are okay but the monthly charges have left distributors frustrated. Even the little commission they make goes back to the company. I would rather buy a product that is highly priced once and avoid ongoing mandatory purchases. Compensation Plan: Understanding this is very important. Is it sustainable in the long run and are their diminishing returns as time passes? If feasible, try to compare it with plans being offered by others. Training And Support: The company should be in the continuous process of providing training and motivational support. And then this is how we closed our discussion. He gave me a tight one on my back side and blurted, “Damn, why didn’t you tell me earlier about it. If you hadn’t, you would have lost a friend”. Where is he now, and doing what? You can take a fair guess, and I assure you that you would not be wrong. You too wish to know more about QNet!!! I am not surprised. I am an Army Officer, who is now re-attired as a Corporate Warrior, and having interest in varied fields from IT to Arts, and Photography to Blogging. I have an inherent inclination for motivation training and personal inspiration. Being an admirer and staunch supporter of human values and humanity, I am always on lookout for means which can help society at large. I am also an extremely passionate Direct Selling Professional and vociferously promote the concept of Time and Financial Freedom. I can be reached by filling the contact form. Thanks for your appreciation. I feel honoured. Yes, there is a definite need for the people to understand this and appreciate this wonderful opportunity being provided by the direct selling industry. Those who grab the opportunity now, are going to be sure shot winners in the long run. AmeZing Blog... Nice insight for starters !!! I love the way you mentioned it !!! - My Independent Representative (IR) Number is IN004207, and can be used appropriately. - Clicking on the posted photos and slides in the blog will zoom them for a better view. - Comments on the blog posts will, both guide and motivate me. So, go ahead without hesitation. - You may also express your 'LIKE' on the Facebook link, and also forward it to your contacts. - In case of a frequent visitor, consider joining the 'Followers' group.